In the immediate vicinity of a small Provençal town, 20 minutes from the motorway, Old vineyard property carefully renovated by the current owner. An ancient park of 1.8 hectares planted with hundred-year-old trees, partially enclosed by stone walls, surrounds the estate with approximately 600m² of living space and consists of a majestic 'Maison de Maitre', an Orangery, And stables converted into gites and guest rooms. A spacious 16x5m secured pool enhances the relaxation Area. The privative house benefits from a surface of 160m ² of which 6 rooms and 2 rooms of water as well as 3 big rooms of hosts. A second building communicating with private courtyard and dovecote presents 2 guest rooms and 2 gîtes (3 rooms) with independent outdoor spaces. Finally, the old winery offers 2 gîtes (2 and 3 rooms) and additional outbuildings (200m² approximately). 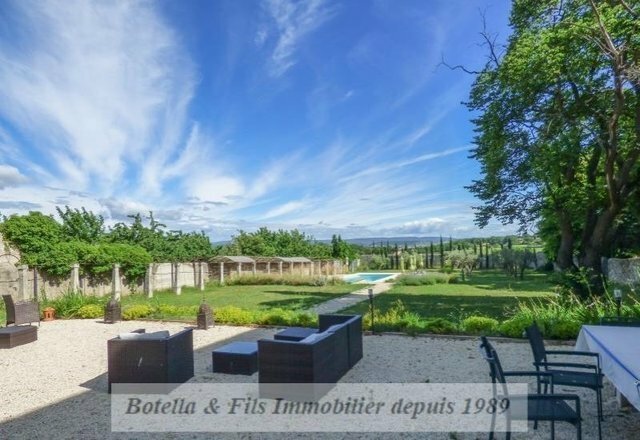 A property selected by Botella et fils immobilier since 1989. Réf. 10340.